Posted in: Uncategorized. Tagged: derivatives, futures, Options, scott murray, VIX, VXX. Every dip is bought, and all spikes (or bumps, really) in volatility are sold. 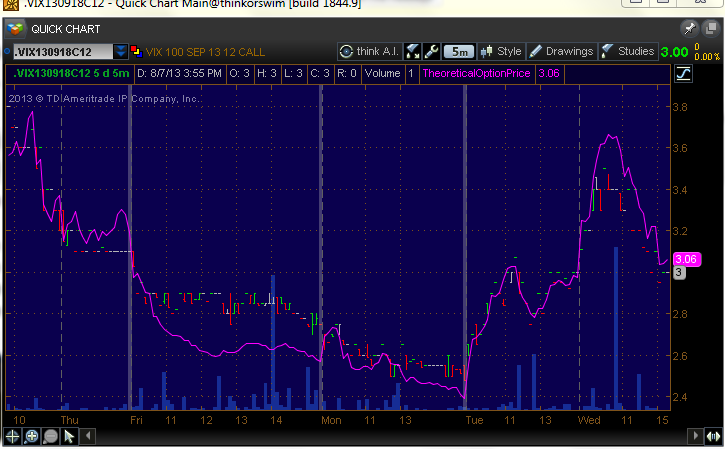 Today, VXX put buyers or call sellers had another banner day from 11 am forward. The story remains the same, as a 1% down day in the S&P is a distant memory for market participants. The experience of a real correction is long, long ago for a lot of those now holding equities. And for some retail holders, newly out of gold and bonds and into stocks, the next one will be the first for them since 2008. Anything below 15 for September seems sort of ridiculous. There are a ton of events and history after Labor day to contend with. That is why one may be better served going in a different direction than holding naked VXX calls, not that I ever advocate that strategy. The roll will kill you while you wait, and spreading them either with calendars or verticals offers little in the way of asymmetric risk/reward. This last sentence refers to current pricing and implied volatility, which of course will change and make some trades very enticing in the VXX some day soon. For $5750 of initial margin,you can hold one September futures contract for $15,050. Then if the VIX September future goes to 18, your return would be $3/$15.05 x 15050/5750 = 52% or so. Not bad right? Or, you can buy the VIX September 12 option for $3.05. (the VIX options track the futures, not the VIX) As the VIX is 15.05, you are paying zero premium above the spot VIX versus the VIX future. Beautiful. Then you get even more leverage, if say the VIX spikes, you get almost dollar for dollar of upside. What makes this great is that the VIX future has 40 days to expiration, and a ton of event risk in the month. In a twist of amazing irony, the VIX September future expires the day of the FED meeting! The market gods arranged that. $2.50 to $3.50 in a day, and you’re out. So, so simple. Buy it below $3, sell it above $3, rinse and repeat. I would not be surprised to see this work a few times. So when you see a bounce in S&P in the near term, go looking for this option. The downside is incredibly low due to the structure and the upside is the sky. This is the kind of trade you wait for, and you only get it this easy when the VIX is 12ish.